Hugo Vargas wants me to know he is not a hero, but every day he fights. He refers to himself as a young adult even though at 16 he is technically still a child. I first learned of him from the Mission SRO Collaborative, which is part of the nonprofit Dolores Street Community Services. The Collaborative organizes with single room occupancy (SRO) tenants throughout San Francisco’s Mission District on issues such as evictions and fighting big development — basically all the drains on life that low-income folks are forced to contend with in neighborhoods dealing with hyper-gentrification. The Collaborative’s Outreach and Campaign Engagement Coordinator Chirag Bhakta — himself a proud San Franciscan who was “born and raised in the Tenderloin, yo” — speaks ardently of his young client. Sadly, Hugo’s is one of many families living in cramped and often unsanitary spaces that routinely break a bunch of health and building code violations. Violations which then have to be addressed by the Collaborative. It wasn’t always this way. The family’s journey to an SRO hotel began when they were displaced from their Twin Peaks apartment in November 2013. The monthly rent, which they were just about able to afford on Hugo’s father’s income, suddenly rose by more than 25% to $1,900 from $1,500. The family’s only option was to move in with his aunt and grandparents 20 miles away on the other side of the Bay Bridge in Richmond. From there, he and his 15-year-old sister made the arduous trek to their school in San Francisco. This involved taking BART from Richmond to 16th Street Mission, transferring to the 22 MUNI bus and then boarding the K-train. The lengthy commute required them to wake up at 5 a.m. and they’d still get to school late. By the time they got home, it would be dark. BART fares were adding up to more than $200 a week for the entire family. His father went through another period of unemployment, and Hugo tells me how his mother, knowing how short they were on money, would not eat some days so that her children could have breakfast. “It’s kind of heartbreaking as a little kid growing up to witness how much your parents sacrifice for you,” he says. He shared his living situation with his school principal and teachers and asked for their lenience. Exceptions were made for Hugo. But after six months his parents, concerned by the toll the four to five hour daily commute was taking on their children, not to mention the cost of BART, decided the family had to move back to San Francisco. A family friend told his mother about a vacancy at the Grand Southern. At first, Hugo was excited to return to the city but as soon as he saw the incommodious quarters, he raged against the move. How would all five of them and their belongings fit into the small space? “Just be thankful we all have a roof over our heads,” his mother told him. Her words quickly prompted him to reconfigure his thoughts. He told himself that they were indeed lucky to be in San Francisco again. The Mission was, after all, where he had been born. He told himself he was back home, that he could make it work. “I’m going to school and working hard, so I can graduate from college and get out of here, get a good job then buy my mom a house. That’s my dream…,” he says to me. Hugo continues to dream, despite the odds. Hugo’s family has been residing at the SRO hotel for 1 ½ years. On top of going to school, he participates in activities — playing soccer and being part of a mountain biking team — typical of most kids his age. 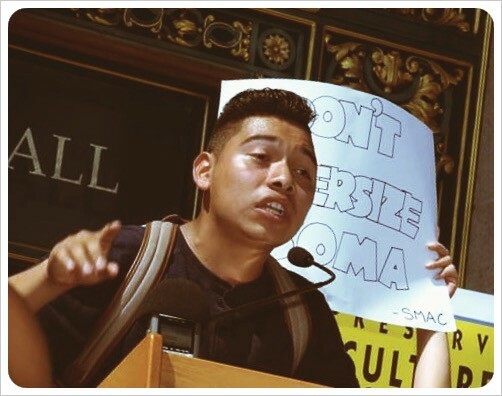 But in addition, the multilingual teenager — he speaks English, Spanish, Nahuatl, knows a Mayan language, and is also learning Italian for his “grandmother’s side” — engages relentlessly with his community through his activism. He is the District 9 representative for the 2016 Youth Commission (Supervisor David Campos has become his friend and mentor); he was selected by Dream’s Future Project under whose aegis he is making a film on gentrification; PODER gave him an internship at Bicis del Pueblo; and he’s involved in a theater class that works with children of incarcerated parents. Of course, the Mission SRO Collaborative is on his side too. Through the organization Hugo has acquired skills to perform outreach in his community and it has even reserved him a place at key hearings so he could speak. It’s the personal touch that has meant so much. This is how Mission SRO Collaborative is trying to save the Mission, Chirag says. As our interview is nearing its end, I ask Hugo about his future plans. He tells me he wants to run for the board of supervisors some day and that he wants to help his community. “I don’t like the fact that the Latino population and other people of color are suffering,” he tells me. These recent ambitions have taken him by surprise. “When I was 12 years old, I was really into books. I used to read about Che Guevara and Cesar Chavez. I watched The Motorcycle Diaries. All that really impacted me,” he says. “But still, I didn’t want to be an activist because you don’t get paid. It’s a struggle. It’s hard work and you’re really putting yourself out there. I ask Hugo what made him do so. Hugo once again asserts — he is not a hero, but a helper. I consider the irony of this statement coming from someone who needs so much help.